Empowering! 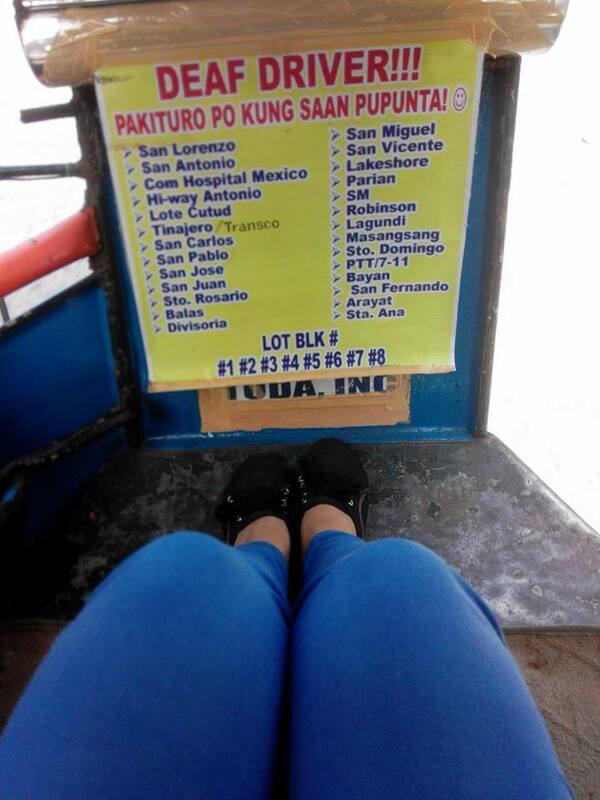 This photo of a tricycle driven by a deaf man in Mexico, Pampanga is currently making rounds in social media. It already has more than 10,000 likes and nearly 2,500 shares in Facebook courtesy of Philippine Star as of this writing. Passengers can point to the location where he/she wants to drop off. “Having such condition, he still works for his family. Such an inspiring person,” says Alyoza Malig Bondoc, the woman who posted the photo on Facebook. Good news to all our Filipino Deaf friends out there. The very elusive board examination for teachers has been conquered by a lady! Her name is Mary Catherine Dela Torre. Most of the deaf after graduating from a bachelors degree in education, will land as teacher aide without any assurance of becoming a regular teacher, unless they pass the licensure exam. Now, it can be done! I’m not saying that she is the first board exam passer. I know of two persons who successfully made it in the past. But one unique thing about Mary Catherine is that she came from a regular college in Iloilo City (Central Philippine University) without the aid of an interpreter although she comfortably communicates in sign language. Also, she broke the tremendous odds by enrolling in a good review school which had helped her a lot. But the best part of it all is the all out support of her loving mother which was always there helping her through her lessons and examinations. * – This Abs-Cbn breaking news video is in Filipino language without an English subtitle. Guys, may I interest you again with another successful Filipino deaf entrepreneur, Emil Zion Punzalan. As one of the proud products of MCCID, he has ventured into a field where communication is a non-issue and the entire world is his portrait. He was recently featured in Manila Bulletin. I reposted the article below. In history, many hearing-impaired people have worked professionally as photographers for decades. Several of them have stood out with their eye for details and visual impact while living in a silent world. Emil Zion Punzalan from Sampaloc, Manila accepted his diploma in Business Technology at the Manila Christian Computer Institute of the Deaf back in 2003. For Zion, an effective photography is when the photographer transforms lifeless shots to amazing images. He has joined several photo contests and won: gold medal in NCR Abilympics Skills Competition in 2005; bronze medal in the 12th National Skills Competition in 2005; and Pixoto hailed him as one of the Best Photographers of the Year 2012. “My goal as a visual artist is to be able to create an image that is even better and beautiful than the actual subject I am shooting,” he says. Appealing may be more than one way to describe Zion’s images. Adjusting above auditory disabilities, he creates and composes images as though they were paintings infused with vivid hues that jump out from a canvas. In a silent but colorful world, he soars beyond his limits. “For me, photography is beyond capturing family memories or documenting an event. It offers a chance to be creative. It is an expression using lighting, color, depth, content, and composition to make photographs into more than snapshots,” he says. Now at 30, Zion looks forward to his coming inspiration with eager anticipation, the birth of his first born baby this June. The original article appears Picture Perfect Special Lifestyle Section and the Mania Bulletin website.